Allow me to introduce myself on this day known as Cinco de Mayo, a name I like pronouncing instead of saying May 5th. In any event, my name is Physocarpus opulifolius, however, you can call me Coppertina — just don't call me Coppertone. I am so over those suntan lotion jokes when it comes to my name. 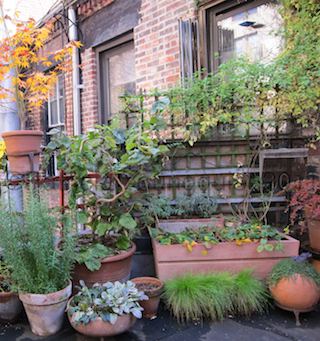 In any event, I am posting an entry to this blog from where I usually stand, in the extreme northwest corner of the rooftop garden belonging to Patricia Youngquist, who normally writes the blog that you now are reading, which she calls The Last Leaf Gardener. Well, actually it's five times, because one of the tulips took it upon himself to post his opinion (the April 27th post) about a Sylvia Plath poem where he bemoaned her reference to tulips. How ungrateful! No poet ever wrote about a Physocarpus opulifolius. I mean the tulips are fairly newcomers to The Last Leaf Gardener's garden, and I have been here for nearly one year, and I don't recall her ever writing a post about me! But the tulips? All those posts about them occurred in less than one month! I guess I should be used to flowers getting attention by now. 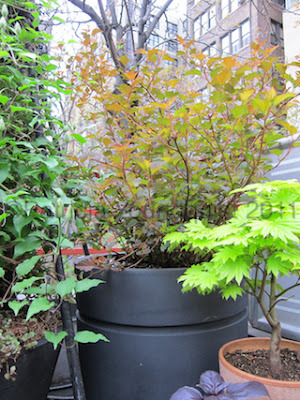 After all, last year, my gardener (aka your blogger) posted about her Paeona suffruiticosa (Tree Peony) six times in six weeks, and remember, she was only posting once a week in those days, so the Paeonia suffruiticosa got all the“press”last year! So, if you'd like some images of me, I highly recommend that you contact my gardener (a.k.a. your blogger) and suggest that she render some photos of me into her unique collection of correspondence materials, or even a fine print. Additionally, The Last Leaf Gardener has already posted about the Paeonia suffruiticosa four times this year, and she only re–opened her garden the week of April 13th, so it has not even been a month and the peony already has four posts! whose leaves you can see to my left in the photograph posted above this blog entry, and if you look closely, you might even see the many, many buds that are about to burst into gorgeous purple flowers, which of course, The Last Leaf Gardener blogged about last year without mentioning my name. I guess I shouldn't take it so personally, after all The Last Leaf Gardener hasn't posted much (if anything) about the little guy to my right (in the photograph at the top of this blog entry), who goes by the name Acer shirasawanum (Autumn Moon) and whom I've nicknamed Limey because of his leaves. BTW, that purple color that you see in front of his container is basil and it smells SO good. And speaking of containers, I can't feel left out when it comes to where she houses me. I have pretty nice digs, eh? Actually I just got them earlier this week when Juan V did some repotting, and I love 'em! 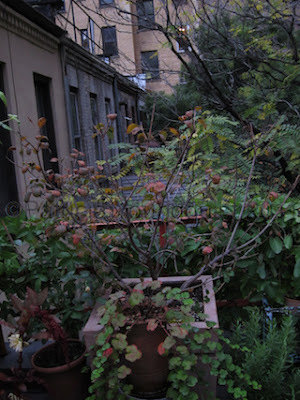 I used to be in terra–cotta, and that's nice too, but my rim cracked (at the end of my growing season last year) while I was being moved out of the corner by Juan V and Patricia, which they did because they wanted to protect me from the harsh winter elements. 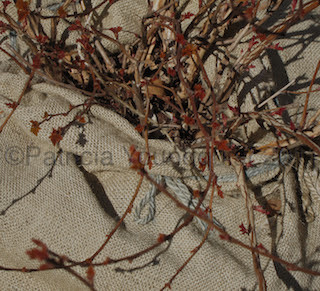 I was safely wrapped — like everything else in this garden — for the winter by The Last Leaf Gardener and Juan V before this past winter's onset as you may know from the blog entry discussing urban garden winterizing. 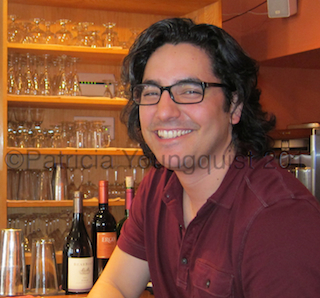 Since I'm not on Facebook (yet), you can check out my photos, both in my former terra–cotta home and also what I looked like in my winer gear when I was just before I was unwrapped for the spring. However, since I'm in a New York terrace garden, I'm really lovin' my new“Viducci”home, especially since my garden comrades already have Viduccis! 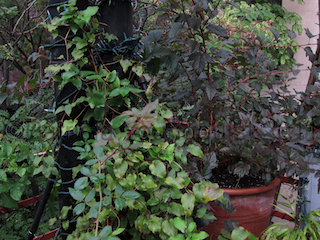 The Autumn Clematis (which is on a diagonal from me so I get to stare at it) got its Viducci two years ago, while the Actinida kolomikta and Actimida (Kiwi Vines) got their Viducci last spring, and the Continus Coggygria (Smoke Bush, Grace) got her Viducci last fall. These can all be seen in the photographs posted below which were taken this past autumn. 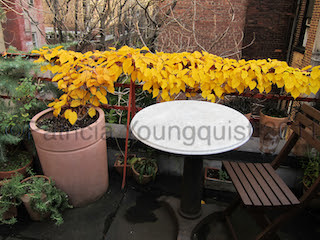 FYI, the Autumn Clematis is going to be featured with the Actinida lolomikta and Actimida (Kiwi Vine) in a YouTube movie about the life in an urban garden from the Kiwi's point of view, as mentioned in a previous post. And an image of the Continus Coggygria (Smokey Bush, Grace) has been rendered into a greeting card has been the subject of a number of blog posts including this one, this one, and this one. “What EVEN Jimmy Buffet (when he was wasted again in Margaritaville) may not have known is, while having“booze in the blender,” may render a“frozen concoction”that helped him“hang on,”having a Grapefruit (yes, I said grapefruit) Margarita at Santa Fe (a restaurant service southwestern cuisine in the Upper West Side of New York City, just off Columbus Avenue on 71st Street), you will be doing more for yourself than just 'hangin on.' 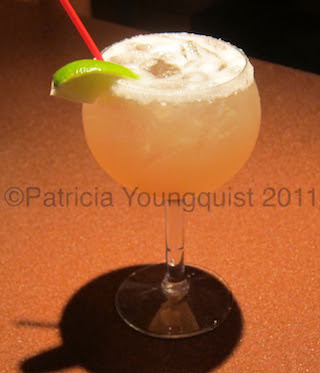 This is without a doubt the best margarity in New York, and deserving of a nod from The Daily News' Best of New York. The grapefruit Margarita (pictured above) is refreshing, with just the right potency, and it was“designed by bartender extraordinaire, Alex (pictured below) . . .
Now dear reader, I'm signing off, but do feel free to put in a good word for me, the Coppertina, when you next contact The Last Leaf Gardener, and do enjoy your Cinco de Mayo, whether you are puttering in your garden, toasting with a Margarita, or just going about your day.